Give the gift of the National Parks with this beautiful coffee table book: the most complete photography book about all US National Parks, and the only one with location notes for each photograph. Winner of 6 national book awards. It is said that a photograph helped launch the national parks. After Congress viewed photos of Yosemite, President Lincoln was moved to sign a bill that paved the way for the U.S. National Park Service. In Treasured Lands: A Photographic Odyssey Through America's National Parks, photographer QT Luong pays tribute to the millions of acres of protected wilderness in our country's 59 national parks. Luong, who is featured in Ken Burns's and Dayton Duncan's documentary The National Parks: America's Best Idea, is the most prolific and versatile photographer working in the national parks and the only one to have made large-format photographs in each of them. In an odyssey that spanned more than 20 years and 300 visits, Luong focused his lenses on iconic landscapes and rarely seen remote views, presenting his journey in this sumptuous array of more than 500 breathtaking images. Accompanying the collection of scenic masterpieces is a guide that includes maps of each park, as well as extended captions that detail where and how the photographs were made. Designed to inspire visitors to connect with the parks and invite photographers to re-create these landscapes, the guide also provides anecdotal observations that give context to the pictures and convey the sheer scope of Luong's extraordinary odyssey. The guide is also available as a PDF formatted for use on mobile devices, and owners of the book are offered the option to download it for a nominal fee. Includes: Acadia National Park, Arches National Park, Badlands National Park, Big Bend National Park, Biscayne National Park, Black Canyon Of The Gunnison National Park, Bryce Canyon National Park, Canyonlands National Park, Capitol Reef National Park, Carlsbad Caverns National Park, Channel Islands National Park, Congaree National Park, Crater Lake National Park, Cuyahoga Valley National Park, Death Valley National Park, Denali National Park, Dry Tortugas National Park, Everglades National Park, Gates of the Arctic National Park, Glacier National Park, Glacier Bay National Park, Grand Canyon National Park, Grand Teton National Park, Great Basin National Park, Great Sand Dunes National Park, Great Smoky Mountains National Park, Guadalupe Mountains National Park, Haleakala National Park, Hawaii Volcanoes National Park, Hot Springs National Park, Isle Royale National Park, Joshua Tree National Park, Katmai National Park, Kenai Fjords National Park, Kings Canyon National Park, Kobuk Valley National Park, Lake Clark National Park, Lassen Volcanic National Park, Mammoth Cave National Park, Mesa Verde National Park, Mount Rainier National Park, National Park of American Samoa, North Cascades National Park, Olympic National Park, Petrified Forest National Park, Redwood National Park, Rocky Mountain National Park, Saguaro National Park, Sequoia National Park, Shenandoah National Park, Theodore Roosevelt National Park, Virgin Islands National Park, Voyageurs National Park, Wind Cave National Park, Wrangell - St Elias National Park, Yellowstone National Park, Yosemite National Park, Zion National Park. American Samoa is a U.S. territory covering 7 South Pacific islands and atolls. 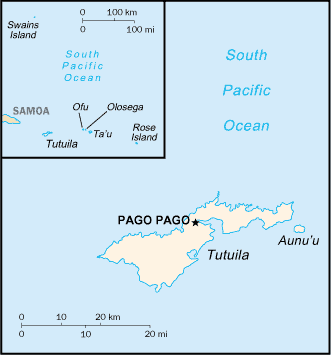 Tutuila, the largest island, is home to the capital Pago Pago, whose natural harbor is framed by volcanic peaks including 1,716-ft.-high Rainmaker Mountain. Folded, indexed map. It contains detailed insets of all islands of Samoa and information about the island and towns. Written in the irreverent style that made How to Talk About Books You Haven't Read a critical and commercial success, Pierre Bayard takes readers on a trip around the world, giving us essential guidance on how to talk about all those fantastic places we've never been. Practical, funny, and thought-provoking, How to Talk About Places You've Never Been will delight and inform armchair globetrotters and jet-setters, all while never having to leave the comfort of the living room. Bayard examines the art of the "non-journey," a tradition that a succession of writers and thinkers, unconcerned with moving away from their home turf, have employed in order to encounter the foreign cultures they wish to know and talk about. He describes concrete situations in which the reader might find himself having to speak about places he's never been, and he chronicles some of his own experiences and offers practical advice. How to Talk About Places You've Never Been is a compelling and delightful book that will expand any travel enthusiast's horizon well beyond the places it's even possible to visit in a single lifetime.